I'm a big supporter and advocate for science education. It's what I've spent a chunk of my career to date on. Sadly, I think getting any basic form of science literacy into the population at large is a seriously uphill struggle and one that is international in scope. On Easter weekend, a wonderful chap called Peter, who used to be a teacher of mine, and who has continued to keep in touch in various inspirational ways, provided me with the clipping from the UK's Sunday Times business section. 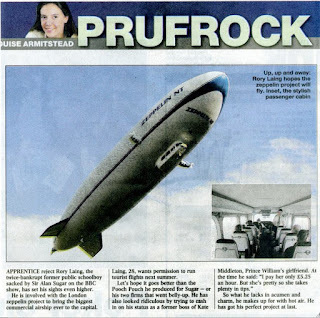 It talks about the fact that a recent 'firing' from the UK equivalent of 'The Apprentice' TV show said that he was going to bring a Zeppelin to London for tourist flights. "So what he lacks in acumen and charm, he makes up for with hot air. He has got his perfect project at last"
Sigh. We've got a long way to go when even a broadsheet newspaper allows this kind of basic fact checking to go undone.